Just finished my TBH based on Phil Chandlers plans, I have built this on a tight budget using reclaimed timber, some plywood I found and some timber on freecycle. The only purchases were the top bars, the top bar guides, leg bolts and the hinged floor eye & hooks. At a cost of £23 pounds all in, I am pleased with the result, not as smart as some on here, as it's all been cut with a hand saw, so rough in places. My only variant from the plans is i didn't go for the mesh floor or the Eco-Floor but went for a solid floor which I hinged and added ventilation holes. The colour scheme was a result of using up what I had in the shed! I am going to build a few bait hives over the winter and hope to attract a swarm early spring. I think you have done an absolutely excellent job. It's really smart! 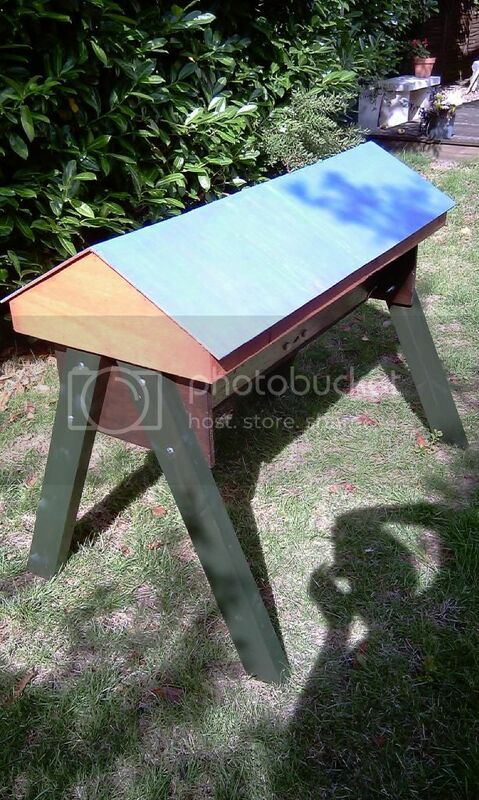 It certainly doesn't look like it's made from reclaimed material and you are obviously skilled with a hand saw. I'm very impressed. I have a table saw and mine doesn't look that good! The only comment I would make is don't use the centre entrances. Most of us have moved to end entrances so that the colony only puts honey stores at one end. That makes it much more simple for winter management, safer for the bees and it also allows you to use the other end as a temporary home for a swarm or split if necessary, whereas having the colony in the centre doesn't leave enough room at either end for anything much. I would drill another hole or two at one end on the opposite side where you already have a hole, so that you have the option to open up more than one, if you go with my suggestion. The other unused holes can always be corked unless needed. Good luck getting a swarm to move in next year. This has thrown me a bit as I had envisaged using the two follower boards from the centre and letting the bees decide which direction to build comb as Phil Charndlers book page 74 with the free end for splits. I thought the advantages were that you can access both ends, and that the follower board and space gave greater insulation. Most of you have moved to end entrances, does this mean you now only have the one follower board? and does it matter which end you use as the entrance, depending on your hives location/orientation? No I still use 2 follower boards. I have a blank bar at the very end which I can lift out and then move the follower back to inspect from that end and then the follower and then the colony and another follower at the back of the colony before the void. Actually I like to have 3 followers, so that if I am utilising the other end of the hive I can create a no mans land in the middle, which allows room to inspect either colony. To confuse things a little more, I actually have vertical face entrances, so my first follower board has holes in it to allow access to the colony. This has the added benefit of creating a baffle for the wind and robbers... an internal periscope entrance in effect as the holes in the follower are in the top, so the bees have a sort of entrance hall when they come in the front door. There is no problem with sloping side end entrances, it is just a matter of preference. I find it easier to watch the entrance activity if it is on the vertical face and it suits my set up. The thing with most stuff on this site is that it is constantly growing and changing. Someone comes up with an idea, we pick it up, try it, tweek it a bit and report our results and then someone tries something else and that gets tested by others and modified further until we come up with something that suits our bees and us best. Different things work better in different conditions. Natural beekeeping is all about being flexible and learning to read what your bees are telling you. Learning from nature, trying to simulate nature as much as possible but still perhaps harvest a little honey or be able to inspect for disease etc. There is no perfect design, but some things work better than others and problems occasionally crop up that can be designed out. The centre entrance is a case in point and was occasionally resulting in some peoples' bees getting stranded at one end of the hive mid winter and starving because it was too cold to cross the empty comb in the middle to get to the stores on the other side. Either the beekeeper needs to ensure that all the stores are at one end in late summer, which may involve rearranging bars with the potential for comb collapse on heavy honey combs and/or robbing or you prevent the problem arising by using end entrances. Like everything in life, the first prototype is not always the best model. I'm sure that Phil would not mind me saying that there are some ideas in his book which have now been improved on. Which is why I made my comment about the entrance location and why it's useful to keep up to date with new ideas on this forum or seek advice. Having said that, don't worry too much about getting it perfect first time because I can guarantee you will find something that you will change after a season's beekeeping in it. Us "natural" beekeepers just can't help tweeking things! That's a smart looking low cost hive you have built there; I hope you get your swarm next year.